Bovine tuberculosis in Ethiopia is a rapidly growing issue, not just for the agricultural sector but with wider social, economic and health implications. Ethiopia has the largest livestock population in Africa, and whilst currently 99% of its national cattle herd is of local ‘zebu’ cattle managed under extensive farming systems, intensive cattle farming – with imported ‘grade’ cattle - is rapidly increasing. Zoonotic diseases such as Bovine TB thrive under intensive conditions, and grade cattle - whilst more productive - are also more susceptible to BTB. The increase in intensive farming combined with centrifugal trade of potentially infected dairy cattle from Central Ethiopia to low endemic regions is likely to increase the overall BTB burden in Ethiopia, and will have the largest impact on poor people who work with and live alongside infected cattle. The ETHICOBOTS project aims at tackling the high burden of BTB in the Ethiopian dairy farm sector and to minimise the zoonotic impact on high risk groups such as staff and their families working on these dairy farms. Various control strategies, including cattle vaccination, will be investigated, with assessments made of their feasibility, acceptance by farmers, and cost-efficiency in order to find the most suitable intervention options to help policy makers and stakeholders to reach evidence-based control policy decisions, and to mitigate health and livelihood risks for poor households. 1 The social and economic status of cattle husbandry in the affected areas, and the place of zoonotic BTB within this wider context. This research will encompass formal cattle trading (through sale and livestock markets), more informal exchange mechanisms, and the trade and consumption of cattle products such as milk and meat. 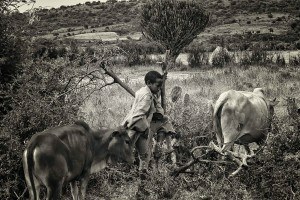 To appreciate how the fallout from BTB can reach deep into social, community and family life, the project will research the significance of cattle for community cohesion, ritual practice (such as bridewealth) and social reproduction as well as their nutritional, economic and labour implications. This will also enable understandings that account for gender, generational and hierarchical differentiation. 2 The management of illness and health in poor families. This thread will investigate the income, resources, food security and health of families involved in high-risk cattle husbandry and dairy and meat production. Investigations will include food and consumption patterns, including handling of milk and meat products, local ideas of infection and disease transmission, use of traditional healers and biomedical services, gender-differentiated roles in health management, food security and family well-being. This research will also explore the potential for mHealth interventions for the management of TB in Ethiopia. Integral to both research threads will be the involvement of citizen scientists recruited from the local communities involved with the ETHICOBOTS project. These participants will be involved not simply as data collectors, but in the coproduction of research that is mutually beneficial to both the project and communities themselves. Engaging community researchers from the outset will help to frame the kinds of questions that are asked, enabling the research to be targeted effectively. Ultimately, this will aid in the development of a BTB mitigation programme (such as treatment, vaccinations) that is locally acceptable and supports families, farmers and dairy workers in their attempts to manage and mitigate BTB and TB in their everyday lives.